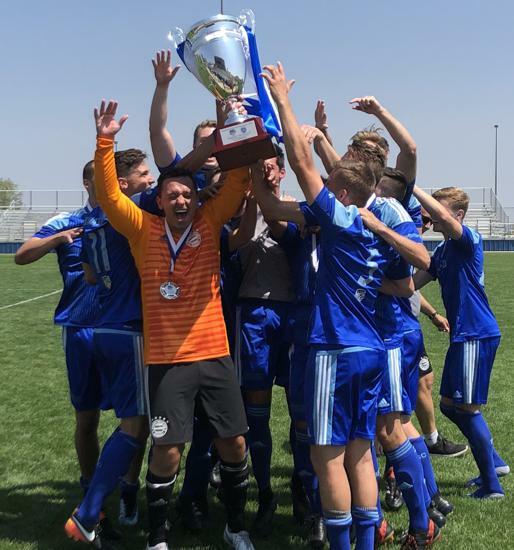 Bavarian SC (12-0-0) was perfect en route to winning the inaugural season of the UPSL Midwest Conference. Our famous Milwaukee, based club defeated RWB Adria, 2-0, in the Midwest Conference Final. They followed this up by being crowned USASA National Amateur Cup champion on Aug 4th and earning the club it's 7th star. When you are on a roll, things just seem to work out, but not before plenty of drama. After an 8 hour flight delay the team stepped off of the plane and onto the field to begin their UPSL National Championship run. Heavy legs and lack of sleep led to a tough outing that went to penalty kicks. After some good sleep and quality food we played much better in the semi-final defeating Miami 2-0 on goals by Logan Andryk. The National Final saw the team come out on fire scoring 2 first half goals and carrying a 3-0 lead until the 65th minute when Arizona FC scored on a penalty and then made it 3-2 only a few minutes later. The team then buckled down and held on to win 3-2. A second National Title in two consecutive weekends and an 8th STAR !!!!! The team will now get a well deserved rest but will be in attendance at the Ice Cream social (Sept 14th) with the National Championship Trophies, and a celebration at Oktoberfest.